Caramel and chocolate basically go hand in hand, right? This is a great recipe for a rich, delicious, and simple chocolate cake that is nothing short of awesome. 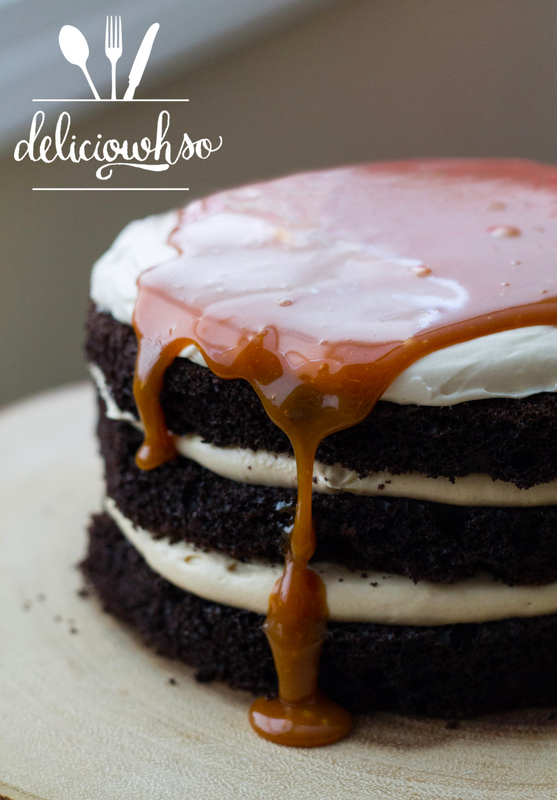 I layered a chocolate cake with caramel buttercream and poured caramel sauce over the top of the cake for a gooey caramel cake! 1. Mix the cake batter according to the box's instructions and bake into cake pans. 2. Allow the cake to cool completely. 3. Cream butter, shortening, and powdered sugar together until completely soft and incorporated. 4. Combine egg whites and sugar and heat in a bowl on top of a pot of boiling water. 5. Allow the egg white mixture to get to about 140 degrees F. The sugar will be completely dissolved into the whites at this point. 6. Remove from the heat and whip to stiff peaks. 7. Mix the meringue into the butter and shortening mixture. 8. Heat sugar and water over high heat. Do not stir. 9. Once the sugar begins to take on some color, swirl the pot. Have the cream ready by this point. 10. Once the sugar gets to an amber color, quickly remove the pot from the heat. 11. Pour the cream into the sugar, and stir. Be careful, the sugar will boil up very quickly. 12. Add the butter and allow the caramel to cool completely. 13. Once the caramel is cool, fold half of it into the buttercream. 14. Save the remaining half for the top of the cake. 15. Slice the cake into 3 even slices using a serrated knife. 16. Once sliced, trim the uneven parts, and then layer the cake with buttercream. This is easiest when you use a piping bag to pipe the buttercream in layers on the cake. 17. Then, put a layer of buttercream on the top. Place the cake into the fridge to set up for about 20 minutes. 18. Check the caramel sauce to make sure that it isn't too thick. If it is so thick that it will not flow at all, heat it very gently until it flows slightly. 19. Make sure that the caramel is not hot or too warm. Then, gently pour it on top of the cake and allow it to come down the sides. I used cake mix to make this cake. It actually works great! It's easy, but also very moist and fluffy. The best part of this cake is the buttercream, so there's no reason to spend too much time making the cake itself!